For the record, I hate ketchup. Not just some brands or in some applications, but all ketchup, across the board, even with the classic pairing of crispy and well-salted french fries. There is no faster way to ruin a perfectly good handful of starchy, fried potatoes than to throw some of that red glop across the top. Too sweet to be comfortably paired with savory main dishes but certainly no dessert fodder, it’s that extra piece of the puzzle that doesn’t make sense anywhere in the bigger picture of a meal, and may in fact have come from an entirely different box. So why on earth did I go and make a quick ketchup, on a blindingly busy day where I had to bake and snap pictures at a breakneck pace? I like to challenge myself, for one thing; Dissecting my reasons for detesting this tomato-based substance, it became a more of a dare. “I bet you can’t make a better version, either,” I taunted myself silently. For another, I can’t resist the temptation to positively bury myself in work, so what better timing than a day when I’m already swamped? Immediately, the ideas started flowing in. A big bag of sun-dried tomatoes provided the initial push, and from a quick internet search and some inspiration, it became an unstoppable impetus. Employing a decent measure of apple cider rather than straight sugar would help cut the sweetness, and a decent bite of vinegar can swing things back to the savory side of the street. 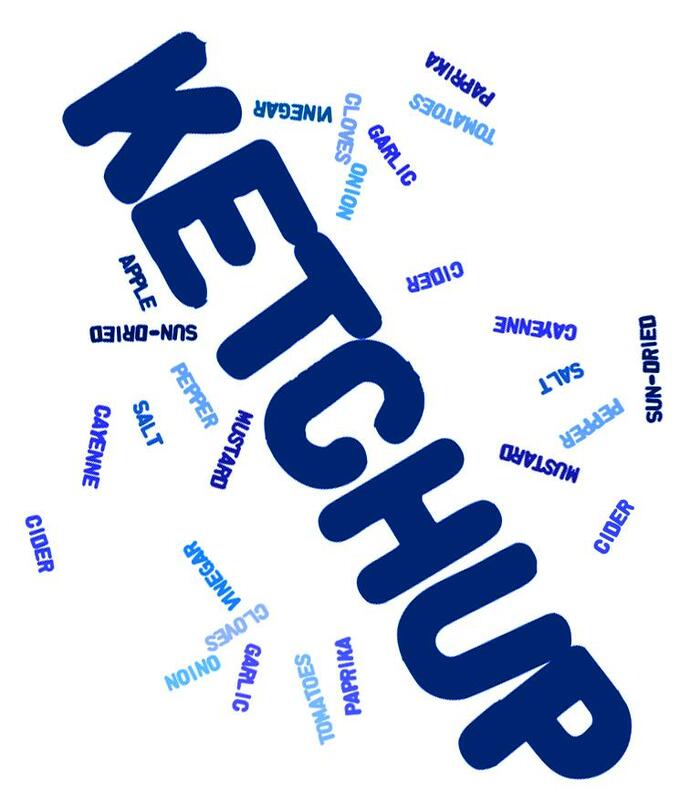 Suddenly, this ketchup concept become entirely more appealing. Unlike traditional ketchup recipes requiring hours of laborious stewing and stirring, the sun-dried tomatoes provide concentrated flavor right from the get go, and the recipe speeds right along. Amazingly, I do not hate this ketchup, which is high praise considering my previous disdain. I can’t say I’m about to slather it on everything that crosses my dinner plate, but those french fries we were talking about earlier? Bring them on. Apple cider rather than straight sugar helps cut the sweetness in this rich, sun-dried ketchup, while a decent bite of vinegar swings things back to the savory side of the street. This procedure hardly needs a written recipe, but here goes: Toss everything into your blender or a sturdy food processor, and puree until completely smooth. Scrape down the sides as need to make sure that everything is thoroughly pulverized. Transfer the mixture into a large sauce pan and set over medium heat. It may seem like too large of a pot, but this stuff bubbles and sputters like mad once it gets going, so the high sides are helpful for protecting the walls (and yourself) from gruesome blood-red splatters. Cook at a gentle simmer for about 30 minutes, until slightly thickened or at least less watery, stirring every couple of minutes to prevent burning. Move the whole batch back into your blender or food processor, and puree once more to ensure a perfectly smooth texture. Let cool completely before bottling and storing. Bear in mind that since this homemade ketchup lacks the additives and preservatives of mainstream brands, you will need to shake it well before each use, as it can separate a bit as it sit. Additionally, it should be kept in the fridge, tightly sealed for no more than 1 month. Bonus! If that label caught your eye, you’re in luck! I’d like to share it with you for your own ketchup creations. Here are three color variations for whatever strikes your fancy, below. Just click on the image and print it out on sticker paper at a 6 x 4 size. Trim, and slap it on a 16-ounce glass bottle. I used a rinsed and dried GT Kombucha bottle, for size reference. Love this! I only like Trader Joe’s ketchup. Yours looks like a barbeque sauce, amazing! Great job! And love the labels!! I can’t stand sugary ketchup either so I understand your disgust. Your packaging is fabulous! I wish someone could launch such branded food product. I would buy it… and I would carry it on my store. Hurray for finding a ketchup you like! I love ketchup but only one brand. I don’t hate ketchup but I seldom use it. I use to dip my potato chips in ketchup – you really must try that with your version. I am absolutely going to try this recipe and the labels are great. Thanks for posting this. Hannah, I could just stare at your pictures all day. Seriously. I DO love catsup with my “baked skinny fries” but cannot justify consuming packaged catsup with its vast quantities of sugar. I can’t wait to try out this recipe! HA! Yep it can be sweet. We are more of a mustard family, love it when we do make those home fries. When purchasing ketchup though, I prefer Westbrae. Yours looks really good with the sundried tomatoes. everything. Luckily we buy the organic kind so it has less chemicals and sugar in it. But I think she would love this too, and love helping to make it (she’s 8). I am definitely going to add this to my “must try” list. Thank you for sharing! Oh say it ain’t so–you hate ketchup!?! Oy vey! Your sundried ketchup looks absolutely divine though; I’d love to dip some vegan pigs in a blanket in it. Mmm. Bookmarked and ready to go once my kitchen is in order! I hate ketchup so much that I can’t even be in the same room as it without gagging. Seriously. Which means I need to try this! Using sun-dried tomatoes is a genius move! Wow why didn’t I think of this?!? Sun-dried tomato ketchup sounds divine. I don’t think I would run out of things to put it on! I’m not a huge fan of ketchup either, but I’ll tolerate it. This looks more than tolerable, though, and I do love the ketchup labels! Cute. Yum! I’ve seen different types through some of my foodie mags and have always wanted to try them. I may just need to make some of my own! Your home made ketchup looks so divine, stunning & I love the bottle cover too! I’m more of a mayonnaise kind of girl myself but this does look pretty good! Your ketchup looks so thick and rich. Do you remember the advertisement, “anticipation… your making me wait…” ? I love your marketing for your product. Go for it. I thought I was totally alone when it came to hating ketchup! Even a tiny bit of it will make me gag and ruin my appetite. Just seeing it on a plate even turns my stomach a bit. Imight try your version, though! I’ve never tasted anything bad that included sun dried tomatoes. Very interesting recipe, I must try it out! You’re right, homemade ketchup is truly in a league of its own! I’m glad you’ve been somewhat converted by what looks like an incredibly delicious version. And thanks for sharing those labels, they’re adorable! I’m not a ketchup person either! I don’t even like doing dishes that have ketchup on them! This sounds great though, I’m a HUGE sun dried tomato fan. And I love the labels! Thanks so much for sharing them, I’ll be spreading the word. I was ok with ketchup when I was younger but now as an adult when I taste it, it feels strange (probably cos’ words have got around abt most store-bought ketchup being “evil”). I am not a huge fan of ketchup myself, so I never thought about making it. But this recipe sounds really intriguing. And I do like sun dried tomatoes – the ones we get from Costco are pretty good. This recipe is a keeper :-). Thanks! I just pinned it on pinterest, thanks so much for sharing! The older I get, the less I like sweet tomato ketchup, and this recipe sounds just perfect. One question, though: What kind of apple cider do you use? Is it alcoholic or just some sort of apple juice? Even here in Germany, “apple cider” describes different drinks depending on your region… Thanks in advance! Yay, thank you for pinning! The apple cider I called for here is the non-alcoholic, juice variety. You can also use unfiltered apple juice, but I like the drier, more complex taste of cider here. I am not a ketchup fan either, but I was thinking a homemade version might be better. This sounds like a great improvement on a standard! Just made it … Bloody Brilliant.. I hate tomato sauce and only use at other ppls bbq’s when budget sausages are on the menu. i added water and proberly a little more than i should of… turned out fantastic.